Sunset by The Bay $6.00 - There is nothing more relaxing than sipping on our Earl Grey tea mixed with peachy fruit bites, as the beautiful crimson sun dips into the deep blue ocean. - I like this cooler. 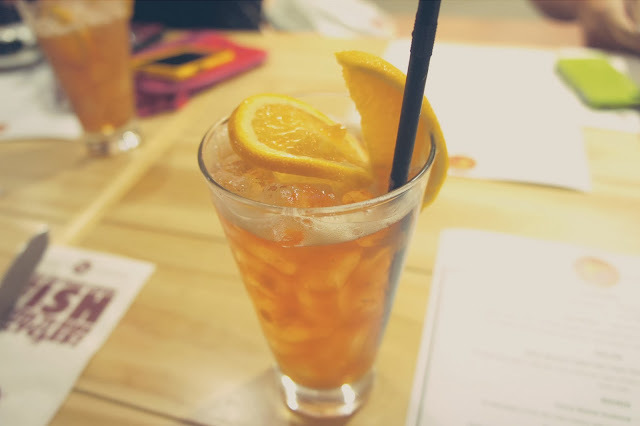 Sweet with a tinge of flavour and it's hydrating. 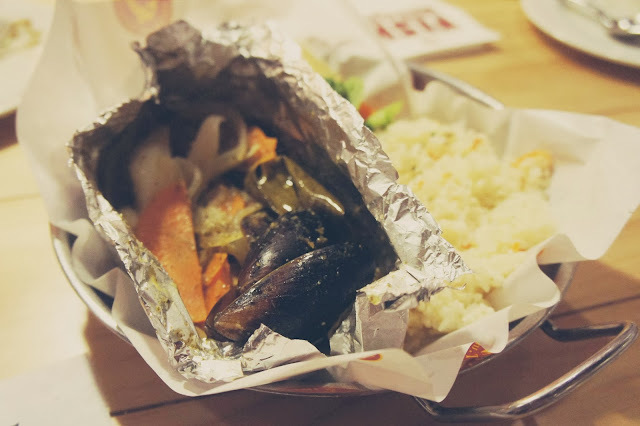 Tex Mex Mussels $5.95 - A Classic recipe from old Mexico and Texas. 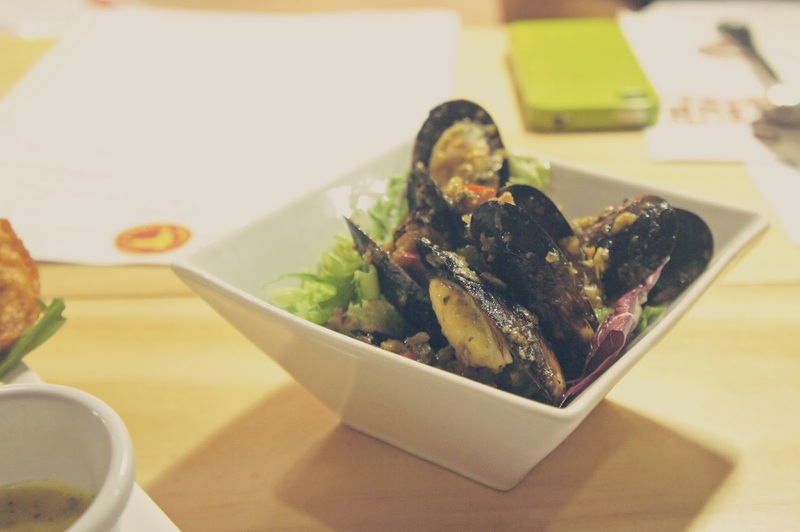 Delicious sauteed mussels with garlic and capsicum with a touch of spice. Quad Delight $13.95 - Can't decide what to have and want a piece of everything? 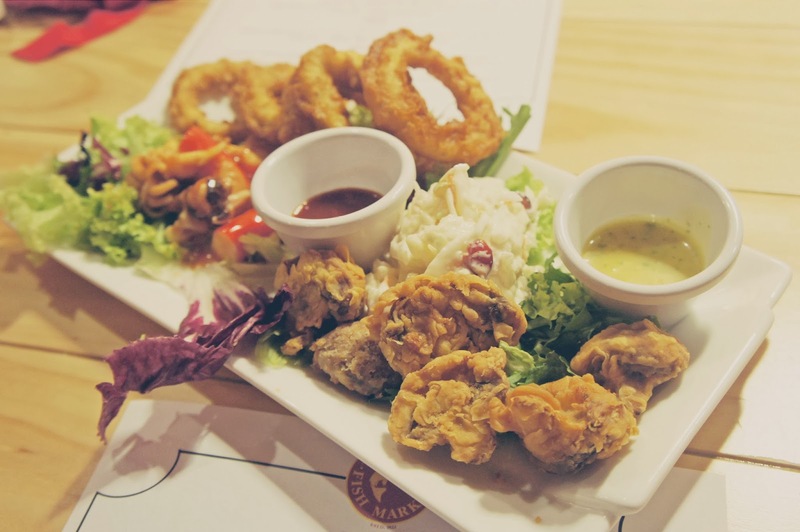 Now you can have the 4 fin-tastic starters with our Quad Delight with fried country mushroom, fried calamari, cranberry coleslaw and chilled seafood mix. Citrus Mesclun Salad with Cajun Chicken $9.95 - The salad that's never a side dish. 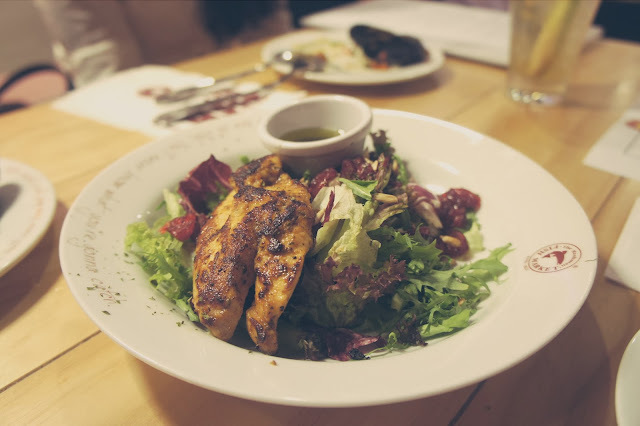 Enjoy grilled Cajun chicken breast on a bed of mesclun salad for a light but hearty meal. - I like the combination of the cranberry bits and nuts, as they add on to the taste of the tasty chicken and greens. 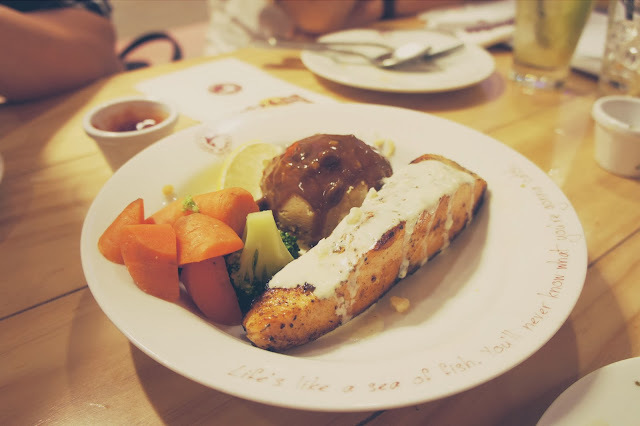 Pepper Mayo Salmon Burger $13.95 - Gently poached salmon fillet in a delicious stock to retain its natural goodness while giving it an amazing flavour. 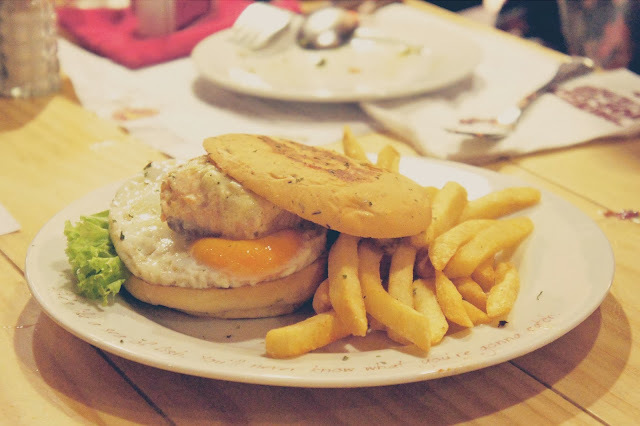 Topped with a sunny side up and drizzled with pepper mayo, it is surely worth the gazillion bites. Citrus Baked Seafood $15.95 - An assortment of dory fish, baby octopus and scallops baked with a tangy marinade with garden herbs. 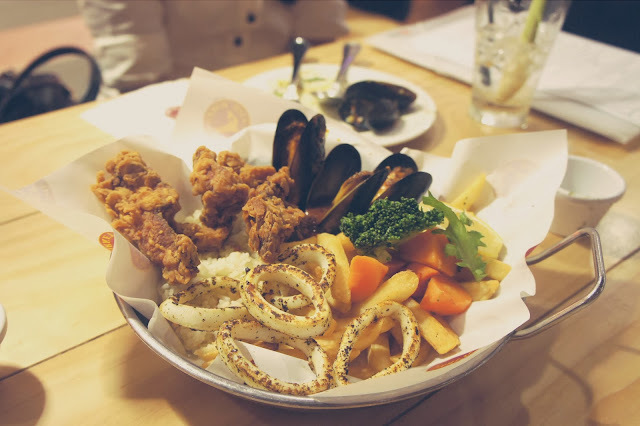 Calamari Mussels Chicken (CMC) $17.95 - Delicious chicken tenders, grilled calamari and sambal mussels with a side of chips, hot veggies and Garlic Herb rice. Who says you can't have the best of both poultry and seafood? 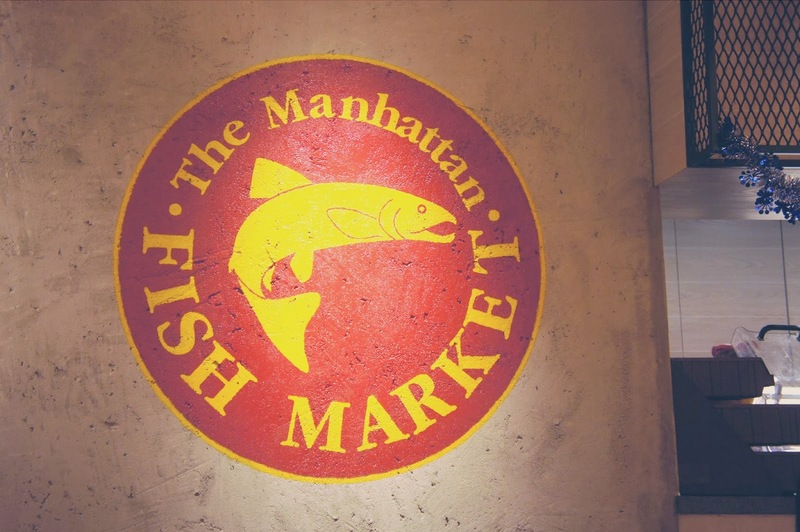 Manhattan Velvet Cake $5.90 - This gem melts in your mouth with every bite conveying a lingering "velvety" sweetness. 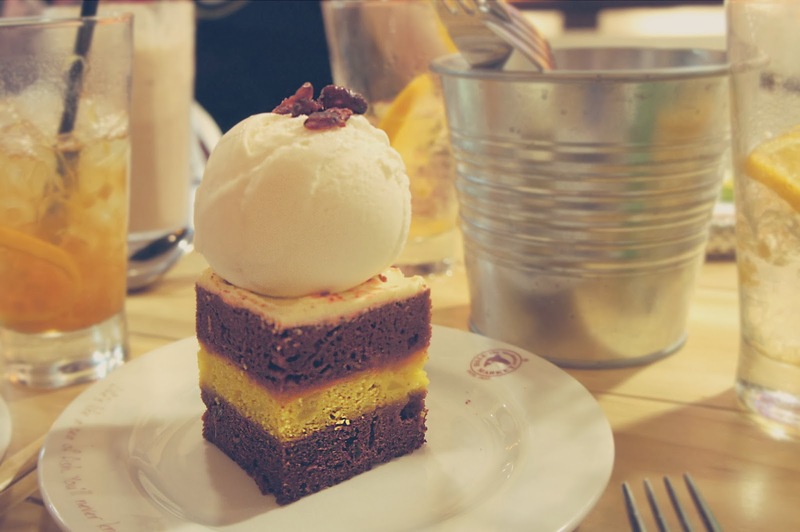 - In between the velvet cake, there's a layer of yellow, pineapple flavoured layer. A very fresh fruity taste, and with the scoop of icecream and cranberry bits, a delicious dessert after a hearty meal. 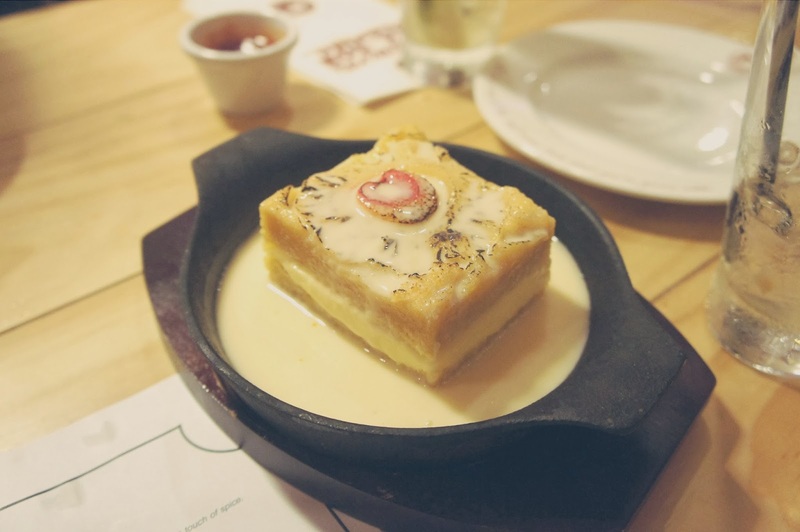 Sizzling Pineapple Cake with Vanilla Sauce $8.90 - Moist pineapple cake with an unusual twist of vanilla sauce, the perfect sweet course to end your meal. - In between the pineapple cake, there's a layer of cream cheese. With the melted caramel on top, the entire dessert is very flavourful. Delicious. The outlet in Marina Square has been renovated since Marina Square had a facelift.